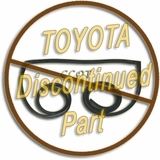 Weatherstrip - Frt Driver's Door - FJ40 - 75-10/84 - "TOYOTA"
Weatherstrip - Frt Passngrs Door - FJ40 - 75-10/84 - "TOYOTA"
Weatherstrip - Driver's Rear Ambulance Door - 79-10/'84 - "TOYOTA"
Weatherstrip - Passengr's Rear Ambulance Door - 79-10/'84 - "TOYOTA"
Weatherstrip - Driver's Rear Ambulance Door - 75-12/'78 - "TOYOTA"
Weatherstrip - Passengr's Rear Ambulance Door - 75-12/'78 - "TOYOTA"
Weatherstrip - Frt Driver's Door - LT Side - 40 Series - 7/'72-1/'75 - "TOYOTA"
Weatherstrip - Frt Passngrs Door - RT Side - 40 Series - 7/'72-1/'75 - "TOYOTA"
Weatherstrip - Frt Driver's Door - FJ40 - 63-7/72 - "TOYOTA"
Weatherstrip - Frt Passngrs Door - FJ40 - 63-7/72 - "TOYOTA"
CCOT has taken the perfect molded shape of OEM W/S and has simply made it slightly thicker with a higher density closed cell foam rubber to better seal out annoying external conditions. CCOT's Custom made "BEST" W/S maintains its seal longer over time because of the compactness and heavier consistency of closed cell foam construction. "BEST" Weatherstripping is a CCOT Exclusive product that fits more airtight and watertight than any other FJ40 weatherstripping. 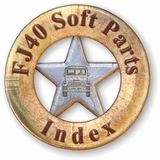 It's the "BEST" Weatherstripping for FJ40s. Rear Door Weatherstripping fits years 1975 to 1984. Also fits BJ40, HJ47 and others with same door style. 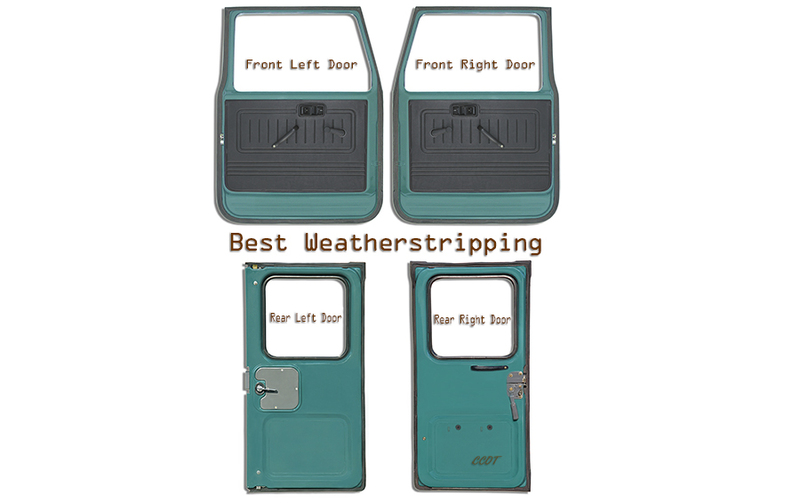 Weatherstripping - Frt Driver's Door - FJ40 - 75-84 - "BEST"
A CCOT Exclusive Part ! We believe this is the best weatherstripping money can buy. Made just like OEM but a little thicker as ordered by CCOT. Note: System will add $6.75 for 1 tube of 3M #08011. One tube will do all 4-Doors. 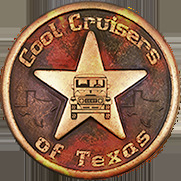 Weatherstrip - Frt Passengr's Door - FJ40 - 75-84 - "BEST"
Weatherstrip - Both Front Doors -Pair FJ40 - 75-84 - "BEST"
CCOT Exclusive Part ! "BEST" Weatherstripping. Purchase both Driver's & Passengers Side W/S at discounted price. Weatherstrip - Passengr's Rear Ambulance Door - 75-84 - "BEST"
Weatherstrip - Driver's Rear Ambulance Door - 75-84 - "BEST"
Weatherstrip - Both Rear Ambulance Doors - Pair - FJ40 - 75-84 - "BEST"
CCOT's original front and rear door weatherstripping is thicker than OEM and made with a higher density closed cell foam rubber. CCOT's original W/S lasts longer because of the compactness of the cell foam construction. CCOT W/S fits more airtight and watertight than original weatherstripping and makes for a much quieter ride. CCOT's original weatherstripping greatly reduces annoying wind noise and drafts. 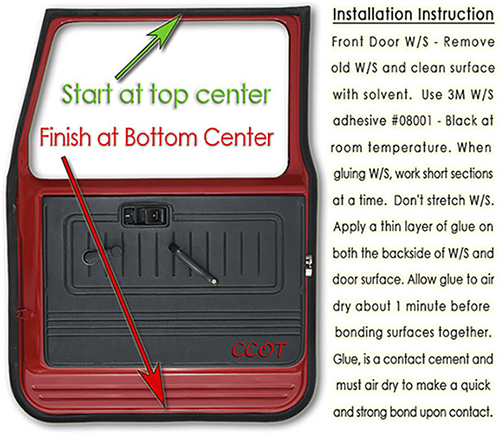 Installation is simple & easy and instructions can be seen below. Weatherstrip - FJ40 - Driver's Front Door - 63-84 - "CCOT"
CCOT weatherstripping with "Formed Corners". Weatherstrip - FJ40 - Passng's Front Door - 63-84 - "CCOT"
Weatherstrip - Driver's Rear Ambulance Door - 75-84 - "CCOT"
Driver's Side Rear Ambulance Door Weatherstripping Fits FJ40 - 1975 to 1984 CCOT weatherstripping with "Formed Corners". Rear Driver's Door Weatherstripping only has 3-Sides. See Installation Instructions below. 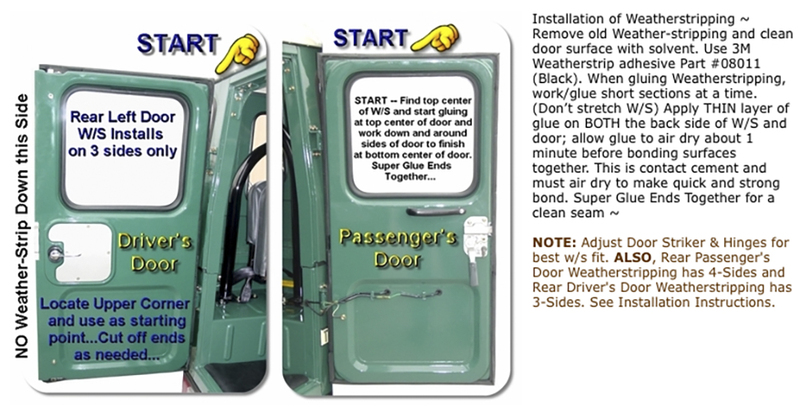 Weatherstrip - Passengr's Rear Ambulance Door - 75-84 - "CCOT"
Weatherstripping - ALL 4-Doors - 75-84 - "CCOT"
Rear Passenger's Door Weatherstripping has 4-Sides and Rear Driver's Door Weatherstripping only has 3-Sides. See Installation Instructions below. Orientation of Weatherstripping to Front Door. You may want to refer to this image before installing W/S. Adjust doors after installing new weather-stripping for optimal seal.